You might be reasonably repulsed by the prospect of an ice cream and squid culinary mashup, but it turns out that if you simply leave actual squid out of the equation, it can be wildly delightful and delicious. That's what New Zealand's Giapo ice cream shop discovered after concocting their unique new "Colossal Squid" cone, a masterfully scooped and sculpted chocolate cephalopod-shaped masterpiece. This elaborate frozen dessert was dreamed up by Giapo's chef Giapo Grazioli to celebrate the 10th anniversary of the the colossal squid's arrival at the Museum of New Zealand Te Papa Tongarewa. 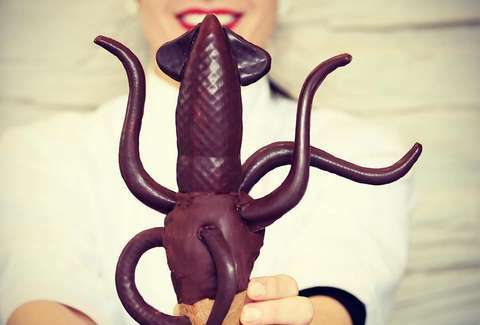 To construct it, a sugar cone is topped with a scoop of ice cream, which is then dipped in chocolate and carefully adorned with a giant squid head and several tentacles, all of which are made with 3D printing technology, and hollow ("to avoid death by chocolate"). Unfortunately, you'll have to fly to Auckland to get a taste yourself, as these elaborate cones are available exclusively at Giapo's sole location, where people have been known to line up for hours to grab one of their signature sculptural treats.